The simply adorable Katie, over at Chocolate Covered Katie, sent a call out for folks to make variations of her Genius Blondies. Do a riff on a gluten-free, grain-free, vegan baked good? Why, of course! The kiddo decided what we should change up, with a little suggestion from me. See, this morning I bought a gallon of Grade B maple syrup. Oh yes, I did. I buy one every spring, and we were down to our last 1/4 cup or so of last year’s batch. So, it was time. Last year’s batch might have been our second gallon of the year. Anyway, that gallon of maple syrup was calling to me. So was the banana on the counter. And the almond butter in the fridge. Okay, maybe I gently prodded the kiddo in a few particular directions. So sue me. He decided to go besan (course chickpea) flour. That was all him. I swear. Anyway, our version turned out more like a sweet corn cake than a blondie. Anybody out there remember the sweet corn cake from ChiChi’s Mexican restaurant? Sort of gooey? Sort of grainy? WAY sweet? And an awful lot addictive? This is like the corn-free version of that. I know. Weird. But, good. Or, it would have been good back in the day when I ate at restaurants like ChiChi’s. Now, it’s a bit too sweet for my tastes. The kiddo, on the other hand, gives it a thumbs up. Genius Blondies? Or just kind of smart blondies? Preheat oven to 350°. Mash the banana in a medium bowl. Blend all ingredients until smooth. (It will look gritty.) Pour into a greased 8 x 8 pan. Bake for 25-30 minutes until edges are browned and top bounces back from slight pressure. The drizzle on top is 1 T. of maple syrup + 2 t. cocoa powder. I wouldn’t have done that if it were not for the fact that I was filling my quart jug from my gallon jug and I overflowed the quart jug and caught the spillage in a bowl. Sheesh – I can’t keep any secrets from you all, now can I? 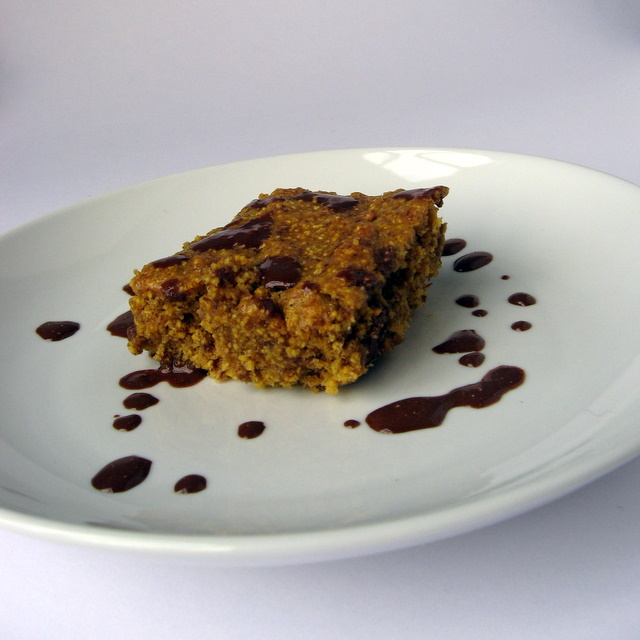 This entry was posted in beans, nuts and tagged banana, beans, blondies, maple syrup, recipes. Bookmark the permalink. Hey, Deanna, that both looks and sounds fantastic! No complaints here at all. 😉 I have all the ingredients except chickpea flour (have not tried that yet, but want to!). I might make these with almond flour and report back! I’ve seen that blondie recipe, and definitely need to do a variation! Love the way you used maple in these Deanna, that sounds so deliciously rich!